Gardner is one of many young entertainers who has gotten exposure over the years working with Don Ho. Her debut album, recorded for a Japanese record label but available here, is a natural step forward for her. She plays the ukulele in the Ho show, and the best numbers here emphasize her instrumental skills. "Carol of the Bells," however, also displays her vocal talent. Yes, she sings too! Gardner's producers should have relied less on computer programs and synth tracks elsewhere. The electronics clash with the natural, organic sound of her ukulele on several songs. An enthusiastic guitarist intrudes on others. 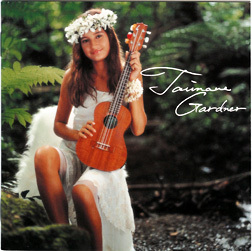 Gardner doesn't need a lot of musicians backing her, although the instrumental interplay between her, Tsuyoshi Kon on acoustic guitar, and an assortment of electronic add-ons works surprisingly well on "Nada Sou Sou." "Surfin' Medley," her big number in Ho's show, adds to the value of the album as a showroom souvenir. It shows off her rapid-fire picking and strumming quite well, even though she takes some unfortunate liberties with the lyrics of "Johnny B. Goode." "Moloka'i Slide" introduces her as a Jawaiian/pop singer. There isn't much ukulele here, but it displays her versatility. Storyteller Gere returns with a collection of stories he describes as "stories of local kids for local kids." Most sound relatively true-to-life, and several offer sugar-coated messages about the importance of having compassion for others or confronting scary situations. Others address the ebb and flow of sibling relationships. The finale, "Secret Weapon," is a fantasy that about a boy who makes a loud noise when he gets scared. The sound -- we're talking body noises here -- is guaranteed to entertain youthful audiences. 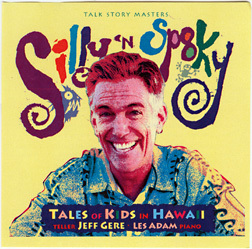 Gere uses an imaginative variety of voices and sound effects in telling these local stories. Les Adams (piano), Alana Cini (didgeridoo) and Sandra Lee Akana (screeches) provide musical accents and help set the mood. Are all the artists on this recycling project actually "Hawaiian born," or do some of them come from elsewhere? No background information is provided on the artists or the songs, but with three video clips included, there is at least some added value to this compilation. Judged by the contents, however, a better title would be "Jawaiian Born," since almost all the selections are of that genre. 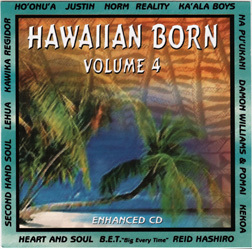 "Hawaiian Born," written and recorded by Norm Thompson, is one of best songs here, and is an admirably original statement about local identity. A generic remake of "Your Precious Love," the Marvin Gaye/Tammi Terrell gem of the late 1960s, perpetrated here by Damon Williams and Pomai, is the worst. Light pop ballads by Reality and Kekoa add a welcome bit of musical diversity.